Welcome to the Arosa Motel. Whether its an over night stay for one person or the annual family holiday for a week or more, we would love to have you stay with us. The Arosa's units have queen sized beds and are all air-conditioned (extra fee may apply). 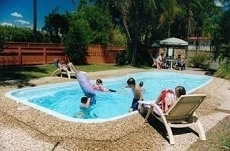 It is set on 2 tree studded acres with an in ground swimming pool, a large undercover BBQ shelter for those great afternoons allowing you to relax, and watch the children play. We are situated only 1.2km south of Coffs Harbour City Centre. There you will find the Palms Shopping Complex, Cinemas, the Ten Pin Bowling Alley and the heart of Coffs Harbour's night life eg RSL Club, Pubs and the Night Clubs. Queen Double Bed with 1 Single Bed / Free 8 channel AUSTAR / Lounge OR Kitchen option(subject to availability) Air Cond / Private secure parking. Rate is for 3 person. 2 Bedroom Villa EACH Bedroom has a Queen Double Bed with 1 Single Bed in EACH Bedrooms / Spacious Lounge / Fully Self Contained Kitchen / 2 Toilets / 2 Showers / Free 8 channel AUSTAR to Lounge and Bedrooms / Private undercover parking.Tariff is for 4 persons. Queen Double Bed with 2 Single Beds. 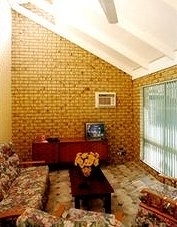 Free 8 channel AUSTAR / Air Cond / Parking outside room.Rate is for 3-4 persons. Queen Double Bed. 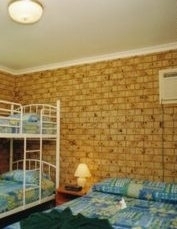 Air Cond / Free 8 channel AUSTAR / Parking outside room.Rate is for 1-2 persons. Queen Double Bed and 1 Single Bed. 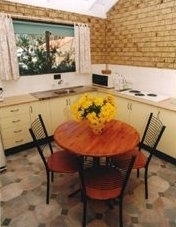 Air Cond / Free 8 channel AUSTAR / Parking outside room. Rate is for 2-3 persons. Internet access / fax / phone. Special corporate rates for extended stays.Spacious Villa Lounges are ideal for business meetings with fully equipped self contained Kitchens. Reception located centrally at the front of the property. Check In times Earliest 1pm...Check Out 10am. The Rooms have a set maximum number allowed for that room type.The Villa tariffs are set for 4 adults with a $13 surcharge for extra guests up to a maximum of 8. Children under 2 yrs and accompanied by a parent or guardian...no charge. Parking directly outside the Motel Rooms. The spacious grounds can accommodate caravans, boat trailers and buses. The Villas enjoy a private road to the rear of the property with high security. From the North 500 metres past the Windmill on the right hand side. From the South 800 metres past the KFC on the left hand side. Close to the clubs, pubs and restaurants. The world famous beaches of Coffs Harbour are a short drive away with a myriad of tourist attractions to see.